Reclaimed hardwood floors have become increasingly popular in recent years, but what exactly are they and why does it matter? When old houses are demolished, the floors are usually also demolished and sent to a landfill. These floors are often hardwood floorboards that are still in fine condition. They may be covered by carpet, vinyl or some other covering, but that can usually be easily removed. To reclaim the floorboards is to carefully remove them, piece by piece, and salvage them before the house is demolished. The salvaged boards are then treated in some way to restore their condition and installed in a new house. There are two main benefits to this: One is that the wood is recycled rather than destroyed. This is good for the environment, reduces landfill, and can save money during the demolition. Keep in mind that new floorboards means cutting down more forests and treating the wood with chemicals. The environmental impact goes beyond just using more wood. The second benefit is that old wooden floorboards are often made from timber that is hard to find or very expensive now due to deforestation. This can include various types of beautiful Australian Oakwood. The deep colours of this type of wood are sometimes mimicked by staining, but the original is always the best. Should I use reclaimed wood? Can you find enough of the same type of wood for your project? It can be tricky to mix and match different reclaimed floors, so for the best result try to find enough of the same original reclaimed floor for what you need. There’s a chance it may cost a bit more than new floorboards. The manual labour involved in carefully removing an existing floor and restoring it is quite intense, so reclaimed floors are often not cheaper than new floors. However, the final result will be worth it. Comparing original timbers to modern-day floors is not really an apples to apples comparison. New floors are good, but rarely as good as most reclaimed hardwood. Not all old floors can be reclaimed. Some considerations include the thickness of the wood and, most importantly, the condition. 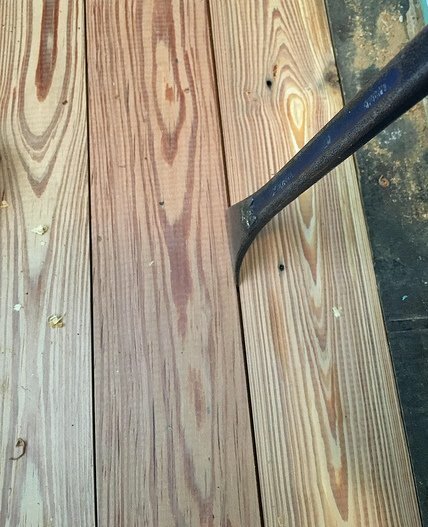 The thickness is important because once the reclaimed floors have been reinstalled, they need to be sanded to help restore their condition and smooth out the floor. If they have already been sanded multiple times in the past, they may be too thin to reclaim. The general condition is also crucial. If the floor has severe termite damage, is rotten, has many holes or bad water damage, it may be impossible to reuse. We can reclaimed floors and install reclaimed floors for your next project. Call us to find out more.